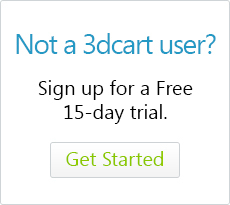 3dcart Professional, Enterprise and higher accounts will have access to the Sales Rep Management module. 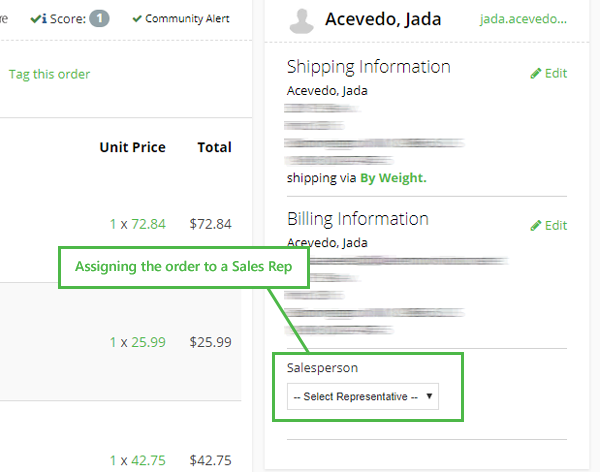 This tool will allow you to assign customer records (and orders) to your individual sales reps, as well as a commission rate to each sales rep. With the module, the store will also keep track and report on commissions owed to your sales reps.
Once at the Modules page, use the search bar at the top to locate "Sales Representative Tracking"
Click "Save" at the top right of the page. Once you've entered the relevant information for the sale rep, click on the "Save" button to have the represenative added. 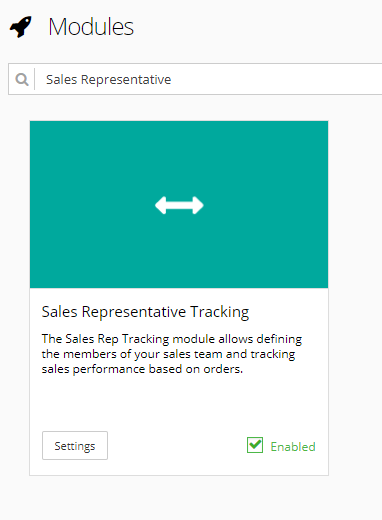 You may edit existing Sales Rep accounts on the same page by locating the sales representative entry and clicking on the action wheel located to the far right of the rep's listing. All subsequent orders placed for the customer will be automatically assigned to the sales representative's account. Taking an individual order and assigning it to the Sales Representative to give them credit for the sale. Click "Save" at the top right of the screen. Any future orders placed by or for this customer will now post to the selected Sales Rep's record. Set the Sales Person for the order and click "Save" at the top right. The order will now be included in the Sales Representative's commission reports. This module adds two new reports that intended to show activity (and owed commissions) for your Sales representatives. Allows you to run a report on an individual Sales Rep's orders for a given time frame. The report will include the rep's commission rate and commission amount. Allows you to run a report on a report on all your Sales Rep orders for a given time frame. The report will include each rep's commission rate and commission amount as well as a commission amount for all combined sales representatives. You may print and export these reports as needed using the buttons located at the top right of the page. If your Sales representatives also have staff access to your Online Store Manager, you can use the Administrator User Permissions to limit the access they have to customer records. This can be useful if you would like to give your sales reps the ability to view and edit their respective customer records, but only their customer records. 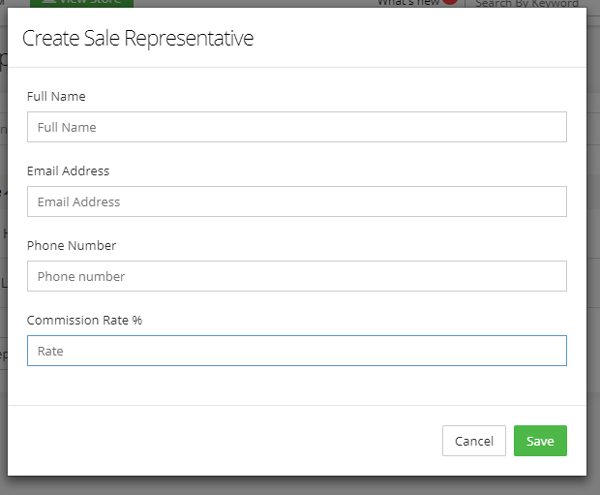 When setting up the Admin User Permissions for the Sales Person, you will see a drop down menu labeled "Sales Rep" that will allow you to select which Sales Rep record the admin user is tied to. If you also grant the admin user access to the Customers permissions sets, then they will be able to go to Customers >Customer List and see only their assigned customers. They will also have access and the ability to see any customer records that are not locked to other sales reps.